I was rummaging through my photos from Derby and realised that I had a couple of rather nice shots I hadn’t shared yet. 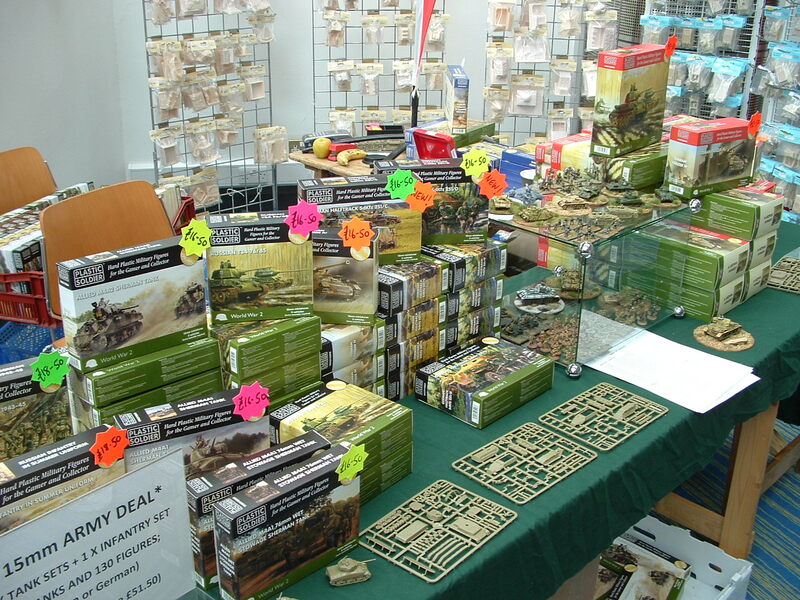 They’re the Plastic Soldier Company stand, showing some of their rapidly growing range of 15mm and 1/72nd and 28mm models. The reason this is at all relevant is that I’ve got a pile of their models to review, and I’ll be doing that over the next week or so. This is a sort of introduction, in case you’re not familiar with their range. They are producing new kits at a prodigious rate, and seem to have a great nack for getting everything you need on a single sprue, balancing the detail of the kit with the practicality of a wargaming model. I’ve been really impressed with what I’ve seen so far, and without wanting to jump the gun on any later comments, I think they look to be coming out on top for 15mm models, certianly. And they’re cheaper than the competition too, which is never a bad thing. Some German infantry here. I particularly like the medic. And a mixed bag of armour. I’ve left these images pretty big so you can see the detail. 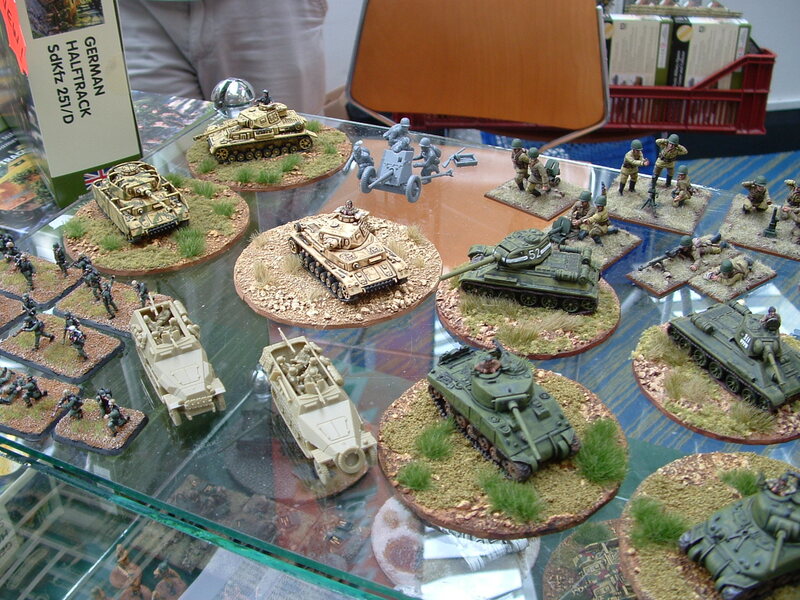 You can see their latest models (the unpainted 251s) at the front. I look forward to reading your thoughts on these as I’ve been looking at them as cheaper alternatives to the flames of war models which are just so expensive. They are really nice and compared to Forge in Battle they are way better (FiB really has problems with vehicle proportions) and also quite cheap. > It takes me a little bit more to clean up than a BF resin tank. I’ll comment on the clean up when I’ve had a chance to build some of them. In general though, I’d rather be modelling in plastic than resin as it’s much easier to work with, more convertible and plastic glue sticks things in a permanent way that superglue just doesn’t. Hm, sure superglue does not melt it, but GF9 is quite a potent superglue that I love to work with. BTW the bast plasticglue I can recommend is: “UHU plast special”, comes even with a metal needle-nozzle tha can easily be cleaned with a lighter in cas it should clog up. I’ve not tried GF9 superglue, though I have tried half a dozen brands, including various expensive ones, runny ones, thick ones, etc. I just don’t like them. These days I only use superglue if I want a temporary bond. A friend of mine recently told me it was the perfect thing to stick the slightly bendy plastic of the DUST models together with, so I may try that. That’s about its last gasp for me though. I hate sticking things back together after they’ve been painted, and that happens all the time with superglue; never with 2 part epoxy; very rarely with plastic cement. I’ve been using Humbrol liquid plastic glue for years, but the pots do last for ages. I’ll have a look at the UHU when I come to get a replacement. Dude, if superglue isn’t doing it, pinning + superglue does it almost every time for me. If you’re familiar with Lich Lord Terminus (the big Cryx caster with the wings), he’s a bit of a nightmare to stick together because of the wings. There’s not a very large contact area between the wings and the body, and those are big wings. I put two pins in each join, and he’s been rock solid ever since. Yeah, pinning is a good idea for those small joints, especially when the material is heavy. I would rather it dried faster too, but then I’d rather it took its time to make a bond that won’t break rather than falling apart at the slightest excuse. I have never had a bond break that was glued with Araldite 2-part epoxy (in anything, never mind models), and I’ve used it for about 35 years. It will generally hold bonds without pinning too (and drilling into non-lead metal is a pain). Ooo? Cheap 251s? I’ll be having some of those. Just those, some Panthers and maybe some aircraft, and I’ve got everything on the WWII 15mm shopping list. 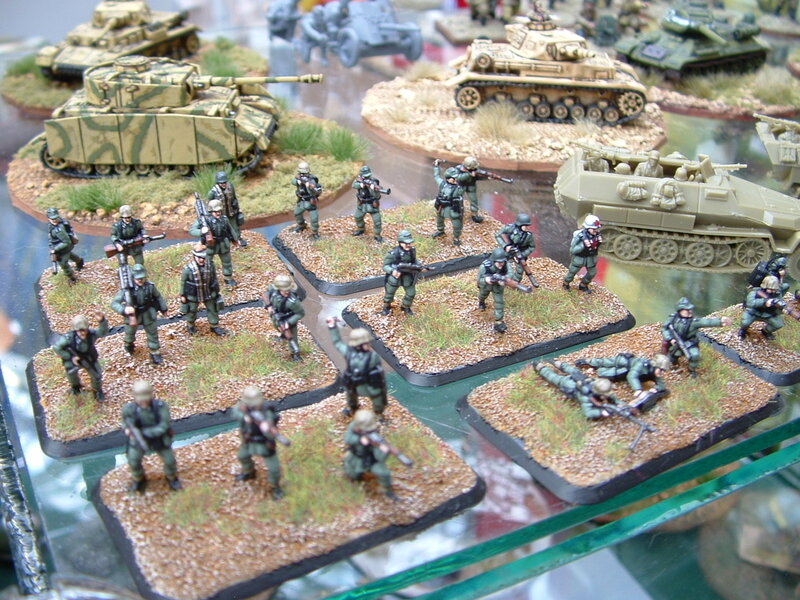 Estoy creando un wargame y me gustaria ver estas comparaciones para darme una idea antes de comprar las figuras, pues tengo pensado comprar infanteria de Bolt action 28mm con vehiculos de 15mm de plastic soldier company o bien 1/72. I don’t have all the models to hand to take those pictures for you, I’m afraid. However, I’ve done these comparisons myself in the past and would recommend sticking to the same scale for infantry and vehicles. If you’re familiar with photographs of real armies and battles, mixing scales looks wrong. No tengo todos los modelos a mano para tomar esas fotos para usted, me temo. Sin embargo, he hecho estas comparaciones a mí mismo en el pasado y lo recomendaría pegue a la misma escala para infantería y vehículos. Si está familiarizado con las fotografías de los ejércitos y batallas reales, mezclando escalas se ve mal.